Billboard is an American entertainment media brand owned by Prometheus Global Media. It publishes pieces involving news, video, opinion, reviews, events and style. It is also known for its music charts, including the Billboard Hot 100 and Billboard 200, tracking the most popular singles and albums in different genres. It also hosts events, owns a publishing firm, and operates several TV shows. Billboard was founded in 1894 by William Donaldson and James Hennegan as a trade publication for bill posters. Donaldson later acquired Hennegen's interest in 1900 for $500. In the 1900s, it covered the entertainment industry, such as circuses, fairs and burlesque shows. It also created a mail service for travelling entertainers. Billboard began focusing more on the music industry as the jukebox, phonograph and radio became commonplace. Many topics it covered were spun-off into different magazines, including Amusement Business in 1961 to cover outdoor entertainment so that it could focus on music. After Donaldson died in 1925, Billboard was passed down to his children and Hennegan's children, until it was sold to private investors in 1985. The magazine continued to change hands to Affiliated Publications (1987), VNU/Nielsen (1994) and its current owner, Prometheus Global Media (2009). As of 2016, it has been shifting to more of a consumer focus online. Formerly located at 770 Broadway, New York, NY, they recently moved uptown to 340 Madison Avenue, New York, NY. The first issue of Billboard was published in Cincinnati, Ohio, on November 1, 1894 by William Donaldson and James Hennegan. Initially, it covered the advertising and bill posting industry and was called Billboard Advertising. [lower-alpha 1] At the time, billboards, posters and paper advertisements placed in public spaces were the primary means of advertising. Donaldson handled editorial and advertising, while Hennegan, who owned Hennegan Printing Co., managed magazine production. The first issues were just eight pages long. The paper had columns like "The Bill Room Gossip" and "The Indefatigable and Tireless Industry of the Bill Poster." A department for agricultural fairs was established in 1896. It was shortened to The Billboard in 1897. 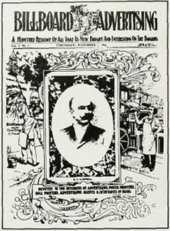 After a brief departure over editorial differences, Donaldson purchased Hennegan's interest in the business in 1900 for $500, to save it from bankruptcy. That May, Donaldson changed it from a monthly to a weekly paper with a greater emphasis on breaking news. He improved editorial quality and opened new offices in New York, Chicago, San Francisco, London and Paris. He also re-focused the magazine on outdoor entertainment like fairs, carnivals, circuses, vaudeville and burlesque shows. A section devoted to circuses was introduced in 1900, followed by more prominent coverage of outdoor events in 1901. These types of events were the antecedents to the modern entertainment industry. Billboard covered topics including regulation, a lack of professionalism, economics and new shows. It had a "stage gossip" column covering the private lives of entertainers, a "tent show" section covering traveling shows and a sub-section called "Freaks to order." According to The Seattle Times, Donaldson also published news articles "attacking censorship, praising productions exhibiting 'good taste' and fighting yellow journalism." As railroads became more developed, Billboard set up a mail forwarding system for traveling entertainers. The location of an entertainer was tracked in the paper's Routes Ahead column, then Billboard would receive mail on the star's behalf and publish a notice in its "Letter-Box" column that it has mail for them. This service was first introduced in 1904. It became one of Billboard's largest sources of profit and celebrity connections. By 1914, there were 42,000 people using the service. It was also used as the official address of traveling entertainers for draft letters during World War I. In the 1960s, when it was discontinued, Billboard was still processing 1,500 letters per week. In 1920, Donaldson made a then-controversial move by hiring an African-American journalist James Albert Jackson to write a weekly column devoted to African-American performers. According to The Business of Culture: Strategic Perspectives on Entertainment and Media, the column identified discrimination against black performers and helped validate their careers. Jackson was the first black critic at a national magazine with a predominantly white audience. According to his grandson, Donaldson also established a policy against identifying performers by their race. Donaldson died in 1925. Billboard's editorial changed focus as technology in recording and playback developed. It covered "marvels of modern technology" like the phonograph, record players and wireless radios. It began covering coin-operated entertainment machines in 1899 and created a dedicated section for them called "Amusement Machines" in March 1932. Billboard began covering the motion picture industry in 1907, but ended up focusing on music due to competition from Variety. It created a Billboard radio broadcasting station in the 1920s. The jukebox industry continued to grow through the Great Depression and advertised heavily in Billboard. :262 This led to even more editorial focus on music. The proliferation of the phonograph and radio also contributed to its growing music emphasis. Billboard introduced a "Record Buying Guide" in January 1939. In 1940, it introduced "Chart Line", which tracks the best-selling records. This was followed by a chart for jukebox records in 1944 called Music BoxMachine charts. By the 1940s, Billboard was more of a music industry specialist publication. The number of charts it published grew after World War II, due to a growing variety of music interests and genres. It had eight charts by 1987, covering different genres and formats, and 28 charts by 1994. By 1943, it had about 100 employees. The magazine's offices moved to Brighton, Ohio in 1946, then to New York City in 1948. A five-column tabloid format was adopted in November 1950 and coated paper was first used in Billboard's print issues in January 1963, allowing for photojournalism. Billboard Publications Inc. acquired a monthly trade magazine for candy and cigarette machine vendors called Vend and, in the 1950s, acquired an advertising trade publication called Tide. By 1969, Billboard Publications Inc. owned eleven trade and consumer publications, a publisher called Guptill Publications, a set of self-study cassette tapes and four television franchises. It also acquired Photo Weekly that year. Over time, the subjects Billboard still covered outside of music were spun-off into separate publications. Funspot magazine was created in 1957 to cover amusement parks and Amusement Business was created in 1961 to cover outdoor entertainment. In January 1961, Billboard was renamed to Billboard Music Week to emphasize its new exclusive interest in music. Two years later, it was renamed to just Billboard. According to The New Business Journalism, by 1984, Billboard Publications was a "prosperous" conglomerate of trade magazines and Billboard had become the "undisputed leader" in music industry news. In the early 1990s, Billboard introduced Billboard Airplay Monitors, a publication for disc jockeys and music programmers. By the end of the 1990s, Billboard dubbed itself the "bible" of the recording industry. Billboard struggled after its founder William Donaldson died in 1925 and within three years was once again heading towards bankruptcy. Donaldson's son-in-law Roger Littleford took over in 1928 and "nursed the publication back to health." His sons, Bill and Roger, became co-publishers in 1946 and inherited the publication in the late 1970s after Roger Littleford's death. They sold it to private investors in 1985 for an estimated $40 million. The investors cut costs and acquired a trade publication for the Broadway theatre industry called Backstage. In 1987, Billboard was sold again to Affiliated Publications for $100 million. Billboard Publications Inc. became a subsidiary of Affiliated Publications called BPI Communications. As BPI Communications, it acquired The Hollywood Reporter, Adweek, Marketing Week and Mediaweek. It purchased Broadcast Data Systems, which is a high-tech firm for tracking music airtime. Private investors from Boston Ventures and BPI executives re-purchased a two-thirds interest in Billboard Publications for $100 million and more acquisitions followed. In 1993, it created a division called Billboard Music Group for music-related publications. In 1994, Billboard Publications was sold to a Dutch media conglomerate, Verenigde Nederlandse Uitgeverijen (VNU), for $220 million. [lower-alpha 2] VNU acquired the Clio Awards in advertising and the National Research Group in 1997, as well as Editor & Publisher in 1999. In July 2000, it paid $650 million for the publisher Miller Freeman. BPI was combined with other entities in VNU in 2000 to form Bill Communications Inc. By time CEO Gerald Hobbs retired in 2003, VNU had grown substantially larger, but it had a large amount of debt from the acquisitions. An attempted $7 billion acquisition of IMS Health in 2005 prompted protests from shareholders that halted the deal. It eventually agreed to an $11 billion takeover bid from investors in 2006. VNU then changed its name to Nielsen in 2007, the namesake of a company it acquired for $2.5 billion in 1999. New CEO Robert Krakoff divested some of the previously owned publications, restructured the organization, and planned some acquisitions before dying suddenly in 2007 to be replaced by Greg Farrar. Nielsen owned Billboard until 2009, when it was one of eight publications sold to e5 Global Media Holdings. e5 was formed by investment firms Pluribus Capital Management and Guggenheim Partners for the purpose of the acquisition. The following year, the new parent company was renamed to Prometheus Global Media. Three years later, Guggenheim Partners acquired Pluribus' share of Prometheus and became the sole owner of Billboard. In December 2015, Guggenheim Digital Media sold several media brands, including Billboard, to its own executive, Todd Boehly. He formed The Hollywood Reporter-Billboard Media Group, which owns both Billboard and The Hollywood Reporter. Timothy White was appointed Editor in Chief in 1991, a position he held until his unexpected death in 2002. White wrote a weekly column promoting music with "artistic merit," while criticizing music with violent or misogynistic themes. He reworked the publication's music charts. Rather than rely on data from music retailers, new charts used data from store checkout scanners obtained from Nielsen SoundScan. He also wrote in-depth profiles on musicians. The website, Billboard.com, was launched in 1995. Keith Girard replaced White before being fired in May 2004. He and a female employee filed a $29 million lawsuit alleging Billboard fired them unfairly with an intent to damage their reputations. The lawsuit claimed they experienced sexual harassment, a hostile work environment and a financially motivated lack of editorial integrity. Email evidence suggested human resources were given special instructions to watch minority employees. The case was settled out-of-court in 2006 for a non-disclosed sum. In the 2000s, economic decline in the music industry dramatically reduced readership and advertising from Billboard's traditional audience. Circulation declined from 40,000 in circulation in the 1990s to less than 17,000 by 2014. The publication's staff and ownership were also undergoing frequent changes. In 2005 Billboard expanded its editorial outside the music industry into other areas of digital and mobile entertainment. Bill Werde was named editorial director in 2008, and was followed by Janice Min in January 2014, who is also responsible for editorial at The Hollywood Reporter. The magazine has since been making changes to make it more of a general interest music news source, as opposed to solely an industry trade. It started covering more celebrity, fashion, and gossip. Min hired Tony Gervino as the publication's editor, which was different than Billboard's historical appointments, in that he did not have a background in the music industry. Tony Gervino was appointed Editor in Chief in April 2014. An article in NPR covered a leaked version of Billboard's annual survey, which it said had more gossip and focused on less professional topics than prior surveys. For example, it polled readers on a lawsuit pop-star Kesha filed against her producer alleging sexual abuse. Gervino was let go in May 2016. A note from Min to the editorial staff indicated that Senior Vice President of Digital Content Mike Bruno would serve as the head of editorial moving forward. Billboard publishes a news website and weekly magazine that cover music, video and home entertainment. Most of the paper's stories are written by staff writers, while some are written by industry experts. It covers news, gossip, opinion, and music reviews, but its "most enduring and influential creation" is the Billboard charts. The charts track music sales, radio airtime and other data about the most popular songs and albums. The Billboard Hot 100 chart of the top-selling songs was introduced in 1955. Since then, the Billboard 200, which tracks the top-selling albums, has become more popular as an indicator of commercial success. Billboard has also published books in collaboration with Watson-Guptill and a radio and television series called American Top Forty, based on Billboard charts. A daily Billboard Bulletin was introduced in February 1997 and Billboard hosts about 20 industry events each year. 1938–2009 (missing issues), archived by American Radio History (online: www.americanradiohistory.com). 1 2 3 "Media Kit" (PDF). Billboard. Retrieved June 15, 2016. 1 2 3 4 5 6 7 8 9 10 11 12 13 14 Lampel, J.; Shamsie, J.; Lant, T.K. (2006). The Business of Culture: Strategic Perspectives on Entertainment and Media. Series in Organization and Management. Taylor & Francis. p. 140. ISBN 978-1-135-60923-8. Retrieved November 5, 2015. ↑ Broven, J. (2009). Record Makers and Breakers: Voices of the Independent Rock 'n' Roll Pioneers. Music in American life. University of Illinois Press. p. 187. ISBN 978-0-252-03290-5. Retrieved November 5, 2015. 1 2 3 Gussow., Don (1984). The New Business of Journalism: An Insider's Look at the Workings of America's Business Press. Harcourt Brace Jovanovich. pp. 32–33. ISBN 0-15-165202-3. 1 2 3 4 5 6 7 8 Godfrey, Donald G.; Leigh, Frederic A. (1998). Historical Dictionary of American Radio. Westport, CT: Greenwood Press. p. 45. ISBN 978-0-313-29636-9. 1 2 3 "Hall of fame. (history's top personalities in the live entertainment and amusement industry) (One hundredth-anniversary collector's edition)". Amusement Business. November 1, 1994. Retrieved November 7, 2015. 1 2 3 4 Writers' Program of the Works Projects Administration in the State of Ohio (1943). Cincinnati, a Guide to the Queen City and Its Neighbors. Best Books. p. 184. ISBN 978-1-62376-051-9. Retrieved November 7, 2015. 1 2 3 4 5 6 7 8 9 10 11 12 13 14 15 16 17 18 19 20 21 22 Dinger, Ed. Nielsen Business Media, Inc. International Directory of Company Histories. 98. pp. 260–265. 1 2 3 4 5 6 7 8 9 10 Hoffmann, Frank (2004). Encyclopedia of Recorded Sound. Taylor & Francis. p. 212. ISBN 978-1-135-94950-1. Retrieved November 5, 2015. 1 2 3 4 5 6 7 Radel, Cliff (November 3, 1994). "Entertainment & the Arts: Billboard Celebrates 100 Years Of Hits". The Seattle Times. Retrieved November 6, 2015. 1 2 3 "New Boss for Billboard". Newsweek. April 4, 1949. pp. 57–58. 1 2 Bloom, K. (2013). Broadway: An Encyclopedia. Taylor & Francis. p. 83. ISBN 978-1-135-95020-0. Retrieved November 6, 2015. 1 2 3 4 Jackson, K.T. ; Keller, L.; Flood, N. (2010). The Encyclopedia of New York City: Second Edition. Yale University Press. p. 638. ISBN 978-0-300-18257-6. Retrieved November 5, 2015. ↑ "Dutch Buyer Acquires BPI". The New York Times. January 15, 1994. Retrieved October 10, 2015. ↑ "Dutch Firm To Purchase Billboard, Film Magazine". Chicago Tribune. January 17, 1994. Retrieved October 10, 2015. ↑ "VNU to Buy Nielsen Media In Deal Valued at $2.5 Billion". The Wall Street Journal. August 17, 1999. Retrieved October 10, 2015. ↑ Deliso, Meredith (January 18, 2007). "VNU Changes Name to the Nielsen Co.". Advertising Age. Retrieved October 10, 2015. ↑ Ives, Nat (December 10, 2009). "Adweek Group Among Titles Sold to e5 Global Media Holdings". Advertising Age. Retrieved October 11, 2015. ↑ "Hollywood Reporter, Billboard sold". Los Angeles Times. December 10, 2009. Retrieved October 12, 2015. ↑ "What's in a Name?". Folio:. October 15, 2010. Retrieved October 11, 2015. ↑ Steel, Emily (January 15, 2013). "Former Yahoo chief moves to Guggenheim". Financial Times. ↑ Numbers, the (January 15, 2013). "Yahoo Exec Tapped To Head Prometheus Global Media". Folio:. Retrieved January 11, 2016. ↑ "Hollywood Reporter Parent Company Spins Off Media Assets to Executive". The Hollywood Reporter. December 17, 2015. Retrieved December 20, 2015. 1 2 "Timothy White, 50; Editor Revolutionized Billboard Magazine". Los Angeles Times. June 28, 2002. Retrieved November 5, 2015. ↑ Pareles, Jon (July 1, 2002). "Timothy White, 50, Billboard Editor in Chief". The New York Times. Retrieved November 5, 2015. 1 2 3 Jurkowitz, Mark (August 12, 2004). "Lawsuit is latest in list of tough hits for Billboard". Boston Globe. Retrieved November 5, 2015. 1 2 3 Grinberg, Emanuella (April 6, 2005). "New motion details racial profiling claims against Billboard magazine". CNN. Retrieved November 5, 2015. 1 2 3 4 Tsioulcas, Anastasia (August 23, 2015). "Why Is 'Billboard' Asking Industry Execs If They Believe Kesha?". NPR. Retrieved November 7, 2015. 1 2 3 Sisario, Ben (January 8, 2014). "Leadership Change May Signal New Start for Billboard Magazine". The New York Times. Retrieved November 6, 2015. 1 2 Lewis, Randy (January 9, 2014). "Billboard Shakeup puts Hollywood Reporter's Janice Min in Charge". Los Angeles Times. Retrieved January 13, 2014. 1 2 Sisario, Ben (April 7, 2014). "Billboard Names Tony Gervino as Editor". The New York Times. Retrieved November 6, 2015. ↑ Steigrad, Alexandra (April 7, 2014). "Billboard Names Tony Gervino Editor in Chief". Women's Wear Daily. Retrieved November 5, 2015. ↑ "Billboard EIC Tony Gervino Exits on a High Note". www.adweek.com. Retrieved 2016-08-15. Wikimedia Commons has media related to Billboard magazine.